Wise words, indeed, but then wisdom does come with age. And at 862 years old, Jermaine Clement’s vampire Vladislav—from the pitch-perfect What We do in the Shadows—has had centuries to hone his personal flatting philosophy. The particular flatting situation at the heart of What We Do in the Shadows (now streaming at a variety of venues) involves four undead roommates who share a gothic old house in Wellington, New Zealand. Seemingly mismatched—there’s the swashbuckling Vladislav, the prissy Viago, the chore-slacker Deacon, and the crotchety 8000-year-old Petyr—these vampires bicker and snarl at each other from time-to-time, but have clearly fallen into an easy, pleasant co-existence. They’re friends. But their comfortable arrangement faces significant challenges when Petyr turns their servant’s vacuous ex-boyfriend Nick into a vampire. Nick promptly moves in with the boys and upsets the whole dynamic. Lucky for us, there is a film crew from the New Zealand Documentary Board on-hand to capture the evolving conflict. Think MTV’s Real World but set in Victorian England but actually modern-day Wellington—so maybe a sort of pseudo-Victorian Wellington?—and you will have a good sense of what to expect. Together, the vampire pals discover the internet and the wonders of video chatting. They negotiate the exclusive Wellington club scene. And when they want to keep a low profile, they eschew flying across the countryside and instead take public transportation out for their night on the town. Clement and Taika Waititi (as Viago) both pull triple-duty here: co-starring, co-writing, and co-directing. Although American audiences will know Clement best from two hilarious seasons of Flight of the Conchords (well, one hilarious season, and then a follow-up), their previous cinematic collaboration was 2007’s Eagle vs. Shark. In that film, Clement starred and Waititi wrote and directed. Where Eagle vs. Shark was charming but uneven, their work on What We Do in the Shadows represents much more confident, effective movie making. Their script is sharp. Their cast—from the central characters to the walk-on parts, especially Rhys Darby as the alpha male among a pack of personally-conflicted rival werewolves—is spot-on. And what it lacks in story the movie more than makes up for with intelligent, character-driven humor, terrific visual gags and asides, and an obvious affection for the classics of the horror genre. What We Do in the Shadows succeeds due in large part to that palpable love and appreciation of horror classics. Its humor may be modern, but its roots and inspiration burrow through more than a century of classic horror cinema. More Young Frankenstein than Scary Movie 5, Shadows’ affectionate take on the horror comedy offers equal parts satire and homage, with dashes of genuine melancholy and dread thrown in for good measure. That tone represents a welcome departure from the current trend in horror comedy. Comedy and horror have been kissing cousins since the early days of cinema. Moments of humor have been the go-to safety valve that horror filmmakers use consistently to relieve audience tension and to provide a break from the suspense and terror. But then a subgenre emerged and fused the horror film with the movie comedy. The dark humor of The Bride of Frankenstein, for instance, eventually evolved into movies like An American Werewolf in London, The Evil Dead 2, and Re-Animator: horror movies first but with a wildly comic spin at the same time. Early full-throated horror satires like The Cat and the Canary, The Ghost Breakers, and Abbott and Costello Meet Frankenstein (and the Mummy, and the Killer Boris Karloff, and on and on) eventually became Young Frankenstein and Ghostbusters. Over the past 20 years or so, any genuine appreciation of the genre has essentially disappeared from the horror-comedy. With the rare exception (say something like Shaun of the Dead or Zombieland), the modern horror-comedy either wants you to know how very hip and smart it is…or doesn’t really care how stupid it becomes. Scream introduced the concept of “meta” into the horror genre, primarily by telling its audience over and over and over again just how “meta” it was. It is unclear if more damage was done in Scream by knife-wielding maniacs or by the main characters (and filmmakers, included) breaking their own arms by incessantly patting themselves on the back. That is not to say that Scream is a bad movie or that “meta” horror is all bad. Funny Games, Behind the Mask: The Rise of Leslie Vernon, and Cabin in the Woods are all interesting, fun (well, Funny Games isn’t fun at all), creative takes on “meta” horror. At the other end of the spectrum is the brain-dead horror-comedy. The Wayans brothers are not entirely to blame here, but they have certainly done more to dumb-down the genre than any family in the history of cinema. Their Scary Movie(s) and Haunted House(s) take the lowest common denominator and somehow still manage to divide it by two. The audience isn’t so much expected to actually find these movies funny but simply to recognize that they are MEANT to be funny, and that is apparently good enough for them. 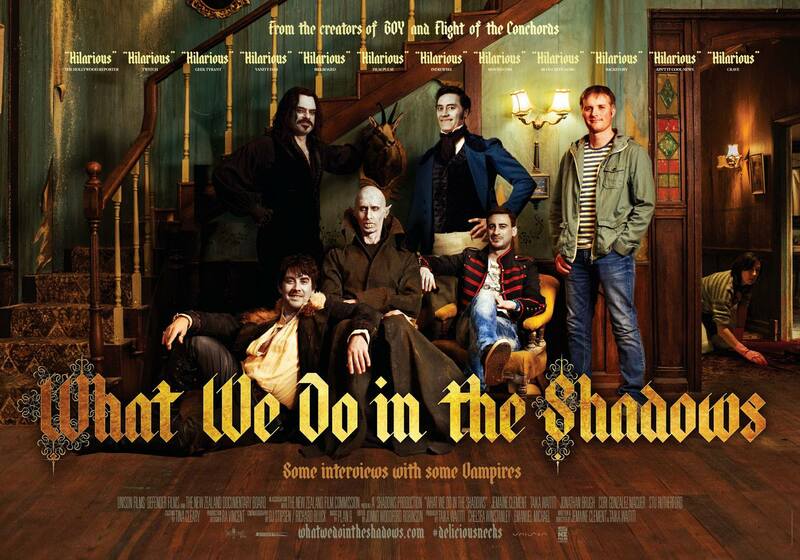 In that context, What We Do in the Shadows is more than a breath of fresh air.